Owner, Property, Unit, and Tenant Info - all together and easy to update! Tenant File puts all key information at your fingertips, whether you need real estate management software for mobile homes, condos, or apartment buildings, as a landlord, owner or property manager. Start with the Activities Screen to see Owner, Property, Unit, and Tenant Information summarized in one place. Each section can be enlarged for full detail. As you enter new notes, they appear at the bottom of the page. Click a navigation arrow to move to the next record. From the Activities Screen, click a tab at the top to instantly switch functions. The Ledger tab opens a history of transactions for the displayed record. Make changes directly into the ledger by simply clicking in the row you want to edit. 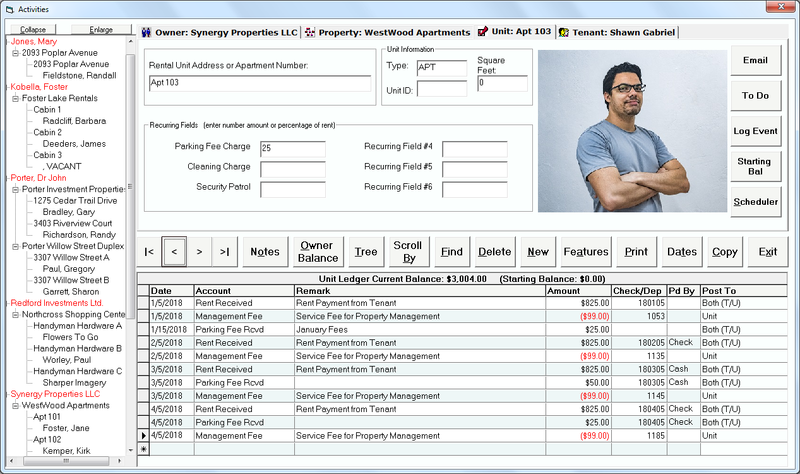 It’s easy to add or delete information about a rental unit, print a statement or a rent receipt. Click on the tree listing to the left or use the “Find” function to locate a property, tenant, or unit. You can email directly from this screen or create 'to do' and 'event' reminders for the current file. The Tenant File Activities Screen is designed with the working property manager or owner in mind, and allows for easy changes and navigation.